From their first hit in 1974 through their heyday in the '80s, Daryl Hall and John Oates' smooth, catchy take on Philly soul brought them enormous commercial success - including six number one singles and six platinum albums - yet little critical success. Hall & Oates' music was remarkably well-constructed and produced; at their best, their songs were filled with strong hooks and melodies that adhered to soul traditions without being a slave to them by incorporating elements of new wave and hard rock. Daryl Hall began performing professionally while he was a student at Temple University. In 1966, he recorded a single with Kenny Gamble and the Romeos; the group featured Gamble, Leon Huff, and Thom Bell, who would all become the architects of Philly soul. During this time, Hall frequently appeared on sessions for Gamble and Huff. In 1967, Hall met John Oates, a fellow Temple University student. 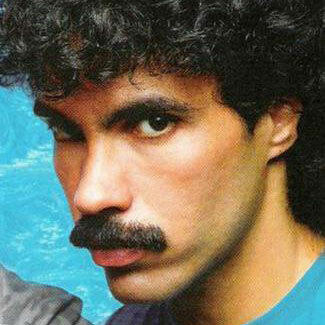 Oates was leading his own soul band at the time. The two students realized they had similar tastes and began performing together in an array of R&B and doo wop groups. By 1968, the duo had parted ways, as Oates transferred schools and Hall formed the soft rock band Gulliver; the group released one album on Elektra in the late '60s before disbanding. After Gulliver's breakup, Hall concentrated on session work again, appearing as a backup vocalist for the Stylistics, the Delfonics, and the Intruders, among others. Oates returned to Philadelphia in 1969, and he and Hall began writing folk-oriented songs and performing together. Eventually they came to the attention of Tommy Mottola, who quickly became their manager, securing the duo a contract with Atlantic Records. On their first records - Whole Oates (1972), Abandoned Luncheonette (1973), War Babies (1974) - the duo were establishing their sound, working with producers like Arif Mardin and Todd Rundgren and removing much of their folk influences. At the beginning of 1974, the duo relocated from Philadelphia to New York. During this period, they only managed one hit - the number 60 "She's Gone" in the spring of 1974. Although they had several minor hits between 1977 and 1980, the albums Hall & Oates released at the end of the decade were not as successful as their mid-'70s records. Nevertheless, they were more adventurous, incorporating more rock elements into their blue-eyed soul. The combination would finally pay off in late 1980, when the duo released the self-produced Voices, the album that marked the beginning of Hall & Oates' greatest commercial and artistic success. The first single from Voices, a cover of the Righteous Brothers' "You've Lost That Lovin' Feeling," reached number 12, yet it was the second single, "Kiss on My List" that confirmed their commercial potential by becoming the duo's second number one single; its follow-up, "You Make My Dreams" hit number five. They quickly released Private Eyes in the summer of 1981; the record featured two number one hits, "Private Eyes" and "I Can't Go for That (No Can Do)," as well as the Top Ten hit "Did It in a Minute." "I Can't Go for That (No Can Do)" also spent a week at the top of the R&B charts. H20 followed in 1982 and it proved more successful than their two previous albums, selling over two million copies and launching their biggest hit single, "Maneater," as well as the Top Ten hits "One on One" and "Family Man." The following year, the duo released a greatest-hits compilation, Rock 'N Soul, Pt. 1, that featured two new Top Ten hits - the number two "Say It Isn't So" and "Adult Education." However, none of the album's other singles broke the Top 20, indicating that the era of chart dominance had ended. Change of Season, released in 1990, confirmed that fact. The record went gold and featured one Top 40 hit - the number 11 single, "So Close." The duo released Marigold Sky in 1997 and Do It for Love in 2003. John Oates soloed on 2002�s Phunk Shui, and Daryl Hall put out Can�t Stop Dreaming in 2003.